Primitive Cooking? I'd Say Not! In Season: Cauliflower and Lobster? Farm Bulletin: Not Just a Tuber...A Dance, Too! 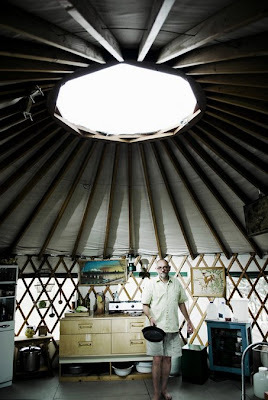 Our neighbor Jim Dixon, writer, olive oil and salt importer and, now, yurt pioneer, just got a great write-up in MIX magazine. Jim sent the following to his customers and gave GSNW permission to reprint it. Happy Thanksgiving! I based this on a recipe from Saveur. It called for using the legs and wings from a whole turkey you’d cut up as an alternative to roasting intact. The breast was boned, pounded thin, stuffed with the same kind of dressing you usually make at Thanksgiving, rolled, tied, and roasted. Sounds okay, but too much work for the most boring part of the bird. I just bought some turkey thighs at New Seasons (one of the best deals in the meat case, but call ahead to make sure they have some). The ones I got were huge, from 25 lb. birds, and weighed about 2 pounds each. I also bought duck fat at New Seasons but, again, call first because they don’t always have it in stock. I’ve also seen recipes that use olive oil, and if you go that route you can save and reuse the oil for cooking. I gave the thighs a good dusting of sea salt and freshly ground pepper on both sides. The Saveur recipe called for sage, thyme and ground bay leaf, but I wanted a more straightforward flavor. I left them in a baking pan in a single layer in the refrigerator overnight, uncovered. I melted 3 lbs. of duck fat on the stove (it comes in one pound tubs, which are probably a little less than a quart), then carefully poured it over the thighs. They weren’t totally covered, but nearly. The pan, tightly covered with foil, went into a 300° oven for about 3.5 hours. I let them cool a bit, then transferred the thighs to Cambros (the plastic containers used in food service...Cambro is the brand name, and that’s what everybody calls them...you can buy smallish versions at restaurant supply stores such as Boxer NW [438 NW Broadway - KAB]). I poured in some of the duck fat, then used another container to save the rest. The fat and juices will separate as it cools, and I’ll save the fat to use again (everything cooked in duck fat is delicious). We’ll crisp the thighs in the fat in hot skillet up at the yurt on Thanksgiving, but I did sneak a small bite as I was putting them away. Delicious! To make simple syrup, in a small pan stir 1 c. sugar into 1 c. water and heat to boiling, stirring occasionally. Cool. Note: You can use any gin, but Hendrick's just seems to have that perfectly balanced floral-herbal character that works magic here. Photo from Eat. Drink. Think. I have to admit that happy hours do just that. They make me happy. I'm happy when someone suggests meeting for a happy hour drink. I'm happy all that day just thinking about it. That evening I'm happy to be sitting and ordering my happy hour drink and little plates of happy hour food. And I'm happiest of all when I get the happy hour check and it's way less than it would be during regular hours. So when my cousin Julie called and suggested meeting for happy hour, you can imagine how...well...happy I was to accept. We settled on 50 Plates because of its proximity to her workplace and because I hadn't been back since a media dinner last July. The bar is a tiny place. Just a couple of small tables and maybe eight stools at the bar, so it's either designed to be crowded or they let folks flow over into the dining room. The ceiling is low and the lighting is intimate. Not that it's dark, but it does have a certain sophisticated sleekness with the low lighting, hard surfaces and black-and-white color scheme. My favorite bartender, Suzanne, holds down the fort on Monday and Tuesday nights, so I knew we were in for a good time. I hadn't had one of her trademark Monique's Gimlets (made with Hendrick's gin) for ages but, alas, they were out of Hendrick's that night. Then, because resourcefulness is the hallmark of a brilliant bartender and Suzanne blows the lid off the Stanford-Binet of mixology, she subbed in a new local gin I hadn't tried called 12 Bridges. 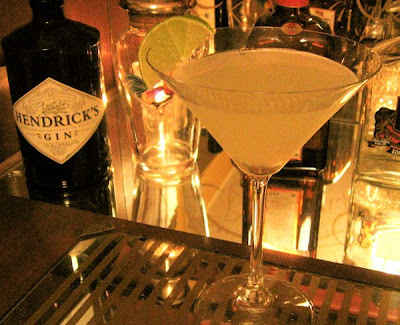 Its flavor derives from the 12 botanicals used in its recipe and it has a distinctive cucumber character as well, perfect for the gimlet. So with that settled, we ordered some nibbles from their bar menu starting with their signature dirty rice beignets (above, right) and, at Suzanne's suggestion, a wedge of iceberg with warmed cherry tomatoes and pancetta drizzled with invisible vinaigrette (left). A couple of other plates, including one of their house-made pretzels, bronzed and salty, that Suzanne brought on the house, concluded our very happy evening. What more can you ask of an hour of happiness? Details: Happy Hour at 50 Plates. Mon.-Fri., 3-6 pm. 333 NW 13th Ave. Phone 503-228-5050. Can you guess which one doesn't belong? 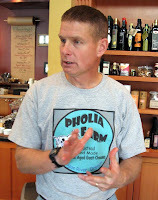 Well, if you guessed #1, thinking it was unlikely that an ex-Marine would be raising Nigerian Dwarf dairy goats with his cheesemaker wife on a farm in Southern Oregon, then you haven't run into Vern Caldwell of Pholia Farm. He and his wife Gianaclis (pron. jon-uh-clees) built their off-the-grid, solar-powered dairy and home in Rogue River, Oregon, on 23 acres of the 220-acre farm that Gianaclis grew up on. 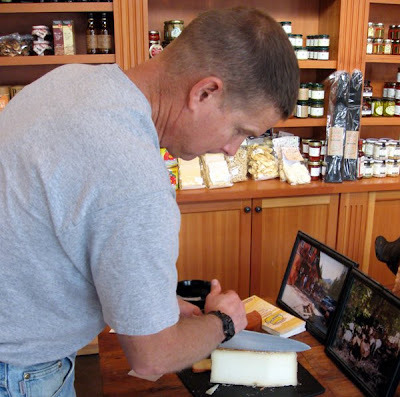 I ran into him the other day when he came up to do a tasting of Pholia's Elk Mountain and Hillis Peak cheeses at Foster & Dobbs, and you couldn't hope to meet a nicer guy. He's so nice, in fact, that his next stop before making the seven-hour drive home was going to be at Quail Run Creamery to help fellow goat-breeder and cheesemaker Scott Catino install some equipment. And Vern and Gianaclis's cheeses? The word "Yum!" doesn't begin to do them justice. 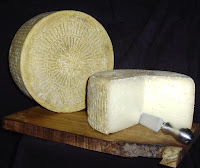 The Hillis Peak has a distinctive reddish rind from the Spanish paprika and olive oil that is rubbed on the outside of the cheese. The flavor is mild with a silky feel, even though it's been aged for at least six months (putting it high on the Dave-safe list). One taste of the Elk Mountain (right), though, made it my instant favorite. Aged for six months and brined in Wild River ale, this cheese has a firm, dry-ish texture and a robust flavor, perfect for a cheese plate with pears and figs. The one I can't wait to try, though I'll have to wait until December to get some, is the Wimer Winter. Made only during the fall and winter, it rates three of my favorite cheese descriptors: salty, creamy and, best of all, stinky. 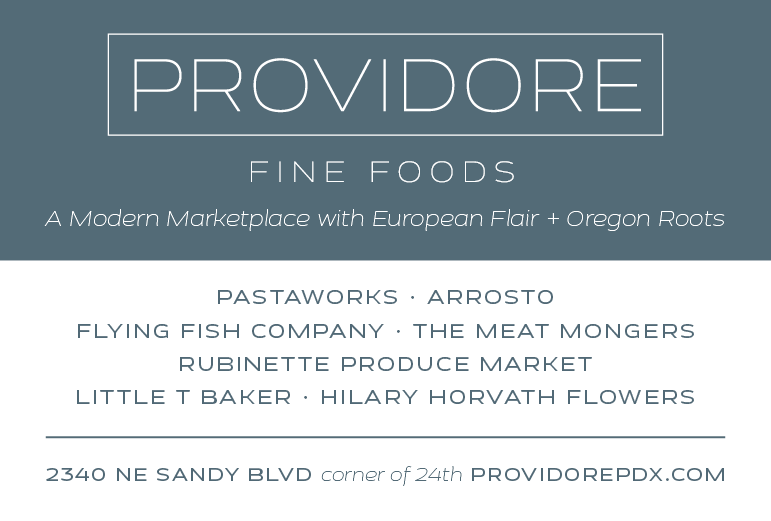 Their cheeses are available at aforementioned Foster & Dobbs Authentic Foods on NE 15th as well as Steve's Cheese in NW Portland. Get some soon! Farm Bulletin: Chestnuts, Persimmons and Turnips, Oh My! Pursuant to the notice below about the holiday farmers' markets this weekend, and despite my smarty-pants teasing about the habits of those on the west side of the river, correspondent Anthony Boutard muses on some history and preparations for these winter comestibles. 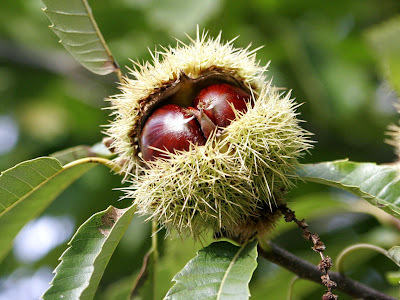 When the chestnut blight struck Europe, the French fought back with several hybrids between the European (Castanea sativa) and Japanese (C. crenata) species of chestnut. These hybrids had good resistance to the strain of blight that attacked the European trees, and the nuts were larger than the pure C. sativa trees. Betizac is one of the earliest of those hybrids, and probably the best, especially in terms of flavor. The original Betizac scionwood, and other varieties of the chestnut, was brought to OSU in the 1980s by Bob Rackham, an OSU extension agent who took an interest in chestnuts. Scionwood is a branch from this year's growth which can be grafted onto suitable rootstock. With the help of Christopher Foster [of Cascadia Chestnuts], we managed to collect some scionwood from those trees before the planting was pulled out. 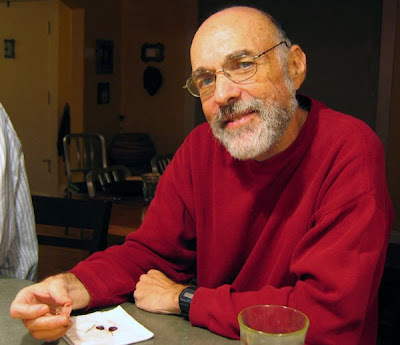 Although he might demur at the suggestion, Christopher is one the nation's leading authorities on the chestnut, and he has been very generous with his time and ideas. Chestnuts must be scored before cooking. We have all manner of tools for the job. The cheapest, easiest and safest, in our experience, is a hooked linoleum blade that fits in a box knife. Unless you are predisposed to making crosses for some religious reason, a single slice will do. We recommend roasting the chestnuts in a good size batch, and then freezing them. An open fire confers a nice smokiness to the fruits. Immediately after roasting, wrap the unpeeled nuts in a few dish towels and let the fruits stew a bit. This makes it easier to remove the inner peel. Peel them while they are hot, or the job will be difficult. We have cured the fruits so they are ready to use this week. They do not store well. Chestnuts are essentially a sweet acorn, and very different from other fruits we call "nuts" in that they are high in carbohydrates and low in fats. Leave them on the counter for a couple of weeks, they will be hard as rocks and about as appealing. Chestnuts are in the oak family, subfamily Diosbalanos, meaning noble acorn. The genus name Castanea is derived from Kastanea, an ancient city in Asia Minor where they were thought to have originated. In Ancient Greece, the response to a beggar was, "Go shake acorns from a tree." Unlike last year, the turnips sold fairly well at the last market. We returned with a mere 10 pounds. This week, we will have mostly Jersey Navet and Early White. We also pulled a few Wilhelmsburger and Gilfeather Rutabagas and some Norfolk Green Turnips. The simplest way to enjoy fresh turnips is to grate or julienne the root, and dress them as a salad. The skin is tender enough that peeling is unnecessary. Trim the top and bottom, and check for wireworm damage. We try to catch the worst problems, but sometimes the worm moves on, and the root heals over the wound. Dress the grated root with mirin and sesame oil. A premium Japanese sesame oil has a more delicate flavor than the heavily roasted types used for cooking. Virgin sesame oil has the most delicate flavor. There are many brands of mirin available and some are sweeter than others. The Mitoku brand has both sesame oil and organic mirin which are well suited for salads. Turnips and rutabagas are also delicious when sautéed gently in a some butter, salt pork or pancetta. For those poorly disposed toward animal fats, olive or coconut oil work fine. We generally dice them into 1/2 inch cubes. The roots are sweet enough that they will caramelize slightly. Great with squash. These are the small persimmons native to eastern United States, Diospyros virginiana. They are distinctly astringent with a clove-like spiciness. The genus name, Diospyros, means "noble pear." The trees are in the ebony family, and the heartwood wood is very dense and strong. It was most commonly used in golf clubs, shoe lasts, pool cues and loom shuttles. When Carol's late mother, Carol Black, hosted a party, she would have a local school teacher, Thelma Johnson, assist her in the food preparations. Persimmon pudding is a classic Eastern Shore of Maryland dessert. It works with with Japanese persimmons, though the native persimmons provide more depth. Pre-heat oven to 325 degrees F. Mix pulp and sugar. Add soda to buttermilk till it quits foaming. Add mix to pulp with eggs and cream. Sift flour, baking powder, salt and cinnamon and stir into pulp mix. Add vanilla. Melt butter in 14" by 10" baking dish. Swish around sides and bottom and add excess to batter. Pour into baking dish and bake for 45 minutes. Cool in dish and serve as squares topped with whipped cream. Approx. 12 servings. Read the other posts in the Turnip Diaries series: Part I: The Wapato Valley, Part II: Chestnuts, Persimmons and Turnips, Part III: Misery Loves Company, Part IV: We're In This Pickle Together, Part V: The Spicy Turnip, Part VI: The Turnip Also Rises, Part VII: WWPD (What Would Pliny Do). I know it's a late notice, but if you can you must head to one of the holiday farmers' markets to gather up the freshest, bestest local ingredients for your loved ones. The Hollywood Farmers Market is holding a blowout Season Finale tomorrow, Nov. 22, with the pick of the fall harvest, as well as crafts, baked goods, meats and cheeses. 9 am-1 pm. NE Hancock between 44th and 45th Aves. The Hillsdale Farmers' Market will be bustling with holiday shoppers who will find turkeys at Kookoolan; preserves, squash and polenta at Ayers Creek; and a rumor of wild huckleberries at Wild Oregon. Get there early! 10 am-2 pm. In the parking lot at SW Sunset Blvd. and SW Capitol Hwy. 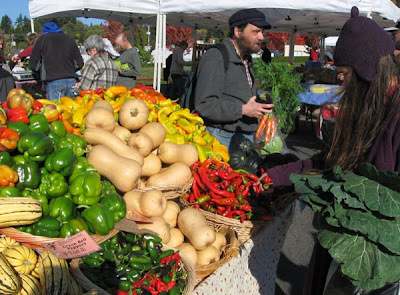 Moreland Farmers' Market is holding a special Tuesday Holiday Market on Nov. 25th with a full complement of their usual fine vendors and will have a food drive for the Oregon Food Bank. 1 pm-5 pm. At the corner of SE Bybee Blvd. & 14th St.
Budding impresario Bob Smith is hosting a Tabor Neighbor House Concert featuring the always eclectic Caravan Gogh playing tunes ranging from gypsy waltzes to all out acoustic rock, from calypso inspired dance tunes to serene soundscapes. Fri., Dec. 5, 7 pm; $15 at door, e-mail reservations required. 1240 SE 56th. Phone 503-239-4089. Okinawan Goat Roast with chef Janis Martin of Tanuki starring the goat in the title as well as side dishes from this island's cuisine that is "heavily influenced by Korean and Chinese cooking." Sun., Jan. 25, 6 pm; $36.50 without alcohol, $46.50 with alcohol. A Dungeness Crab Feed takes Ken back to his roots on the shores of New York and Maryland. Think crab heaped on newspaper-covered tables with dipping sauces galore. Guaranteed to be "a big, messy blast!" Sun., Feb. 22, 6 pm; $36.50 without alcohol, $46.50 with alcohol. Emilia Romagna with its "uncommonly sophisticated peasant foods" is the focus of this dinner, and it's sure to be a memorable evening. Sun., Mar. 29, 6 pm; $32.50 without alcohol, $42.50 with alcohol. Details: Advance payment is required with reservation. Kenny & Zukes, 1038 SW Stark St. Phone 503-222-3354. Tagging along. It's somehow been happening a lot lately. Like my trip to Boise. Or to the spa at Bonneville. And tonight I was invited to accompany a friend to a Slow Food panel on the people who grow, harvest and produce our food. And I love it! So when my friend, neighbor and author of The Farm to Table Cookbook: The Art of Eating Locally, Ivy Manning, asked if I'd be interested in going to Roux to try out their new lunch menu, it was a no-brainer. A couple of years ago I'd heard about the great lunches they were serving, but by the time I got around to trying it, they'd decided close down their lunch service. Fine. And how is it now that they've come to their senses and reopened at mid-day? Rest assured, it's all good news. We sampled a fair amount of the menu, considering it was lunch, starting with hushpuppies (crunchy on the outside, creamy in the middle) and the soft shell crab (okay but nothing to write home about). 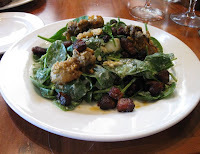 The spinach and fried oyster salad (above left) was terrific with hefty chunks of pork belly, a chopped boiled egg and a creamy remoulade dressing, the oysters briny fresh and crunchy. 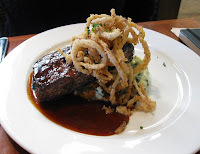 Ivy chose the bourbon-glazed meatloaf (right), a big slab of spicy Creole "Chaurice" sausage mixed with ground sirloin sitting on top of spinach whipped potatoes and topped with frizzled onions and an incredible bourbon glaze. 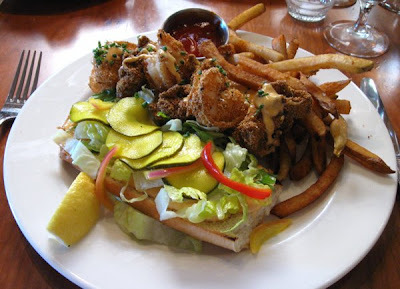 I opted for the classic po'boy (top), this one a combination of crisply fried shrimp and oysters with slices of house-made pickles that gave it a nice tang. The bun was a little too white bread-y and light for me and, in my opinion, it would have been better with a ciabatta-style roll, but I'm sure that wouldn't be traditional. Not cheap but definitely in the moderate range, most lunches and salads are $10 to $12 and the portions are good-sized. And if you can, when you go don't miss the opportunity to ask a friend to tag along. Details: Roux, 1700 N Killingsworth. Phone 503-285-1200. For my last Market Watch column of the season I decided to go to Portland's only year-round weekly farmers' market at People's Co-op. The Hillsdale market does brave the winter months as well, but only twice a month. So whazzup widdat? Are the West-siders too wimpy? Too enamored of sitting and reading the Times with their French press on a Sunday morning? 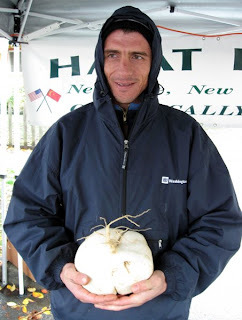 Come to think of it, I've never seen anyone at a market with a five-pound turnip the likes of which Suleyman Idrisov was displaying at his Hayat Farm booth. But you'll find him and other hardy souls keeping the farmers' market flame burning till spring brings everyone else back onto the scene. Details: People's Farmers' Market. Wednesdays, 2-7 pm. 3029 SE 21st Ave., between Powell and Division. 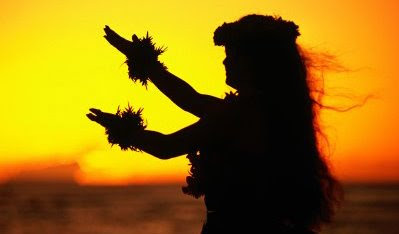 What do you do when you've got hula in your soul but your body is stuck in rainy, temperate Portland? My friend and über-talented food writer, Susan Hauser, discovered her inner wahine when she visited Hawai'i on her honeymoon and became entranced with the culture of the indigenous people of the islands. Her fascination outlasted the marriage, and she eventually found a hula halau, or school, in the appropriately named town of Aloha just outside of Portland. But, as you might imagine, Susan is a woman who never does things halfway. Now she's also studying the 'ukelele as well as learning the Hawai'ian language, and you can follow her progress at her new blog, Hula in Aloha. But watch out. You might just discover you have an inner Hawaiian, too. Peter, Paul and Mary may or may not have meant this song as a political statement, but it nicely encapsulates the philosophy behind the opening of Bamboo Sushi on SE 28th. Formerly a sushi restaurant called Masu East, it was the eastside outpost of downtown's Masu owned by partners Jeff Berback and Kris Lofgren. Lofgren became increasingly concerned about the environmental and sustainable aspects of owning a sushi restaurant, where it's hard to find out how or where the fish is caught, much less the ripples its distribution may have on other species and the environment. He decided to buy out Berback and reopen as the first seafood restaurant in the United States to be certified as sustainable by the Marine Stewardship Council (MSC). Along with MSC, he is also partnering with other blue-chip organizations including the Monterey Bay Aquarium, Blue Ocean Institute and the Green Restaurant Association. 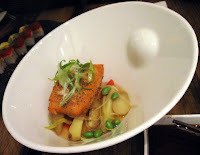 Using the guidelines established by Blue Ocean Institute and Monterey Bay Aquarium, Bamboo says it will only serve seafood listed as "best choices" or "good alternatives." So fine, you say, but how is the food? Well, at an event to showcase the menu for the media, it was both good and a little uneven. Overall, the sushi was excellent with some unusual (and tasty) combinations that you won't find at other sushi spots in town. 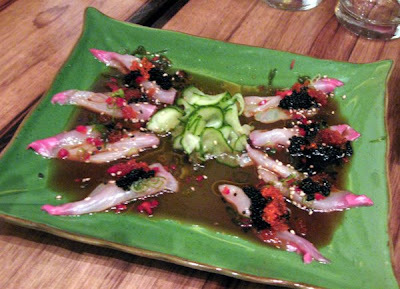 The usuzukuri, made with thinly sliced whitefish, jalapenos, ponzu, green onions, tobiko and sesame seeds (photo, top), was a fresh take on a traditional dish, with salty and sweet flavors combining with the popping of the flying fish roe for a fun sensory experience. The hoki poke box (above left), sushi rice pressed with red crab salad and layered with tuna, avocado, green onion, togarashi and poke sauce, also had the traditional-with-a-twist thing going on, and the grilled kobe flank with sweet potato, sauteed garlic greens with bacon, pickled mushrooms and momiji sauce was amazing. The unevenness came when the kitchen strayed from the Japanese theme, throwing in au courant items like panko-crusted goat cheese (above right), smoked cipollini onions and candied walnuts that begged a "Huh?" response. But the most surprising thing was the desserts, which were actually quite good and worth ordering on their own. The adzuki filo (left, above), basically a red bean paste-filled empanada, was a crunchy, oozing delight and had a sweet potato-lime sorbet with a fence of raspberry poached pears, ideal complements to the empanada's sweetness. 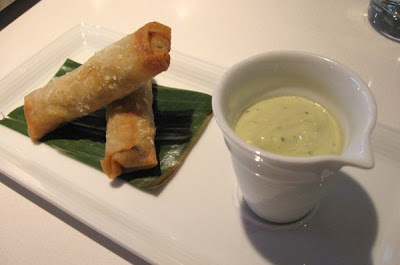 The chocolate "egg rolls" were chocolate pudding-filled pastry rolls that had been rolled in ginger sugar and served with candied ginger ice cream and seasonal fruit. Sensational on all counts. Though Lofgren says they're working hard to keep their prices comparable to other spots in town, it is pricey so choosing wisely (and conservatively) might be the best policy, at least at first. Details: Bamboo Sushi, 310 SE 28th Ave. Phone 503-232-5255. A few years ago I realized that friendships, like love, can be mutable things. Some people come into your life and you're as close as bugs for what seems like only a few minutes, then they're gone forever. Others come and stay for years, becoming part of the fabric of your days. Then there are those who pop in and out over decades, appearing, disappearing and then reappearing when you least expect it. A Mississippi Mud cover titled "Safe in Heaven." Joel Weinstein was one of the latter, a good friend, a writer, designer and cultural gadfly, a self-described "Famous Publisher" (or, more familiarly, FP) who started the iconic and idiosyncratic Mississippi Mud magazine in the 70s, publishing Oregon originals like Walt Curtis, Katherine Dunn, Tama Janowitz, Stacey Levine and Ursula K. Le Guin. 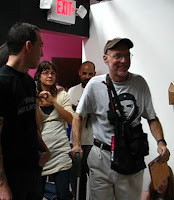 Then, as he and partner Cheryl Hartup moved to follow her career as a curator of Latin American art, first in Miami and then in San Juan, Puerto Rico, he took his second publication, Rotund World, online. Joel on the prowl in Puerto Rico. His writing was always an inspiration, the loopy, fantastical, intertwining lines inevitably landing to make a pertinent point, whether it was about other writers, artists or, especially, pomposity and arrogance should they raise their heads in his presence. Of Rotund World, he wrote that it would contain "homenajes, comings and goings, squabbles, promesas, sales to important collectors, drunken brawls, unconcealed flattery, pissy interchanges, lukewarm showers, boring stretches of nothing going on, accidental deaths, hip-joint replacements, studio hijinks, unintended insults, and a bit of fly-specking, sometimes all at once." He dropped in for dinner when he and Cheryl were in town last Christmas, bringing with him a gift of coffee roasted by friends in PR, regaling us with stories about his new friends there, querying us for tidbits of gossip about old ones here, ears pricked for telltale details that he'd squirrel away for the retelling. 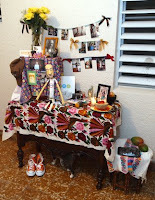 The memorial altar at his home in San Juan (notice the sneakers and the cat under the table). It was a wonderful, warming evening. We didn't know that two months later he would be diagnosed with terminal lung cancer though he hadn't smoked for nigh on 35 years, the irony of which would not be lost on him, to be sure. He passed away on Halloween, and Cheryl opened their house in San Juan to friends and food, music and laughter the next day, the Day of the Dead in Latin culture and also the 18th anniversary of the day they met. 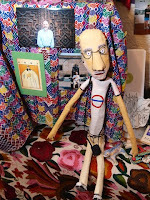 A detail from the altar, with an effigy of Joel in his signature t-shirt, sneakers and shoulder bag. Per his wishes, his ashes will be buried in Lone Fir Cemetery, of which he wrote, "Lone Fir is the resting place of an astonishing variety of those who’ve come to be the city’s natives: along with pioneers and their descendants, there are Russians, Cambodians, Japanese, and Chinese whose families immigrated—some of them generations ago—and stayed." And though we're known for our rain, hippies and volcanoes, he said that they are merely "minor annoyances when compared to the city’s surpassing loveliness. Actually, the hippies are part of the charm, like colorful garden dwarves scattered amidst the tall firs." His friend, Barry Johnson, in a lovely remembrance in the Oregonian, wrote that the Oregon Cultural Heritage Commission, of which he was a founding participant, will celebrate Weinstein with a program called "Discovering Oregon Originals: Joel Weinstein's contributions to Oregon culture," at 7 pm, Wednesday, Jan. 21, First Unitarian Church, SW 12th Ave. and Salmon St.
And don't forget the chanterelles. All of these and more are in season and ready for pickin', so grab your basket or, in my case a friend who knows her spots, and head for the hills. 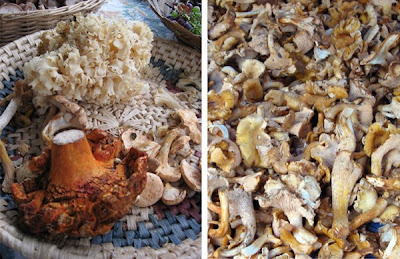 You'll often find the chanterelles and lobster mushroooms in the litter under stands of Doug fir, and word is they're easier (not to mention safer) for beginners because no other mushrooms (i.e. the poisonous ones) look like them. But if the risk isn't worth the reward, I've seen them at local farmers' markets for anywhere from $8 to $10 a pound. Slice them up, sauté them with a bit of butter and minced shallots and you can pop them in a zip-lock bag in the freezer for a midwinter soup, pasta sauce or appetizer on toast. But now's the time to do it before they're gone. "Stevenson (Washington): a quaint riverside drinking town with a windsurfing problem." Or so says a sign in the "Readers" bathroom (you have a choice between that and "Dreamers") at Walking Man Brewing where we went for lunch after our spa experience.Now, a brewpub might not be the expected choice to follow a poshy few hours, but we were ravenous and our other choices were the rather expensive and uninspiring menu items at the spa's restaurant, driving a little further to Skamania Lodge where the view is awesome but I've yet to have a very good meal, or driving back to the Multnomah Falls Lodge, which I've heard has a surprisingly good café. 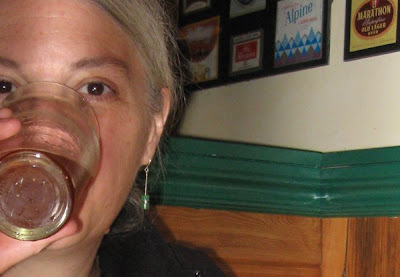 So, as I said, we were ravenous and a salad, pizza and a nice microbrew sounded just dandy. We pulled up to the bottom level of the quaint board-and-batten building next to the railroad tracks and within minutes were slurping down a couple of pints and munching on a very tasty Greek salad. Moments later our barbecue chicken pizza arrived, and moments later it was gone as well. I have a vague recollection that it was pretty good, too, but that's how it is sometimes when you're really hungry. There are also tons of trails in the area, so if you've been hiking or feel like a short field trip, it's a great place to stop in and sit a spell, brew in hand. 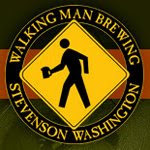 Details: Walking Man Brewing, 240 SW 1st St., Stevenson, WA. Phone 509-427-5520. I'm not big on pampering. I don't do manicures or pedicures, and "having my hair did" consists of going to the nearest Bishop's and having a heavily pierced and tattooed stylist whack off several inches. So getting a massage isn't a weekly, or even a yearly, event in my life. 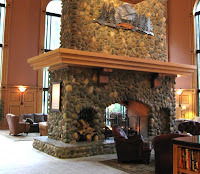 But when my friend Mary invited me to join her at the Bonneville Hot Springs Spa & Resort for some spa action, I jumped at the chance. You see, as far as massages go, I'm a moth to a flame. An alkie to his bottle. As Julie says in the musical Showboat (see above), "Fish gotta swim, birds gotta fly." And when I'm offered an afternoon of spa treatments, you gotta know I'll be there. We started out mid-morning, and even though the weather was semi-crappy, meaning cool and blustery, the incredibly dramatic landscape of the Gorge, with silken ribbons of mist weaving around the hilltops, made for an amazing drive. In 40 minutes we'd crossed over the Bridge of the Gods, driven through the little town of North Bonneville and pulled up to the front door. Now, from the outside this place has all the appeal of a Soviet-era institution, but once you're inside it just gets better and better. The spa staff whisks you into a (very small) locker room where you change into a plush white cotton robe and rubber slippers. 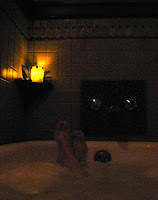 I'd chosen their Ultimate Relaxation bath, wrap and massage, and my attendant Lainie (I had an attendant? Cool!) quietly ushered me into a darkened room with several tubs separated by standing screens. I was given the choice of a lavender or chamomile-scented bath, and on a nearby table was a pitcher of water straight from the spring and a little cup of grapes (unpeeled, alas!). Lainie advised me that keeping the water at body temperature would allow more minerals to be absorbed into my body, but I ignored that and went for warmer water. After about a half hour she was back and held up the robe while I disembarked from my porcelain ship (lower the gangplank!) and took me into another darkened room lined with bodies cocooned in sheets, their faces covered with towels. I had the urge to laugh, but stifled it just in time. Deciding on a medium-tight wrap (rather than tight or loose), she put down a eucalyptus-soaked towel and tucked me in for a half hour rest. Then it was on to the massage with Nick, who escorted me to the men's side of the spa (?) for an 80-minute workout on the table. It went all too quickly, of course, but as we poured ourselves back into the car for the drive home, I was thinking maybe the next pampering event would be coming up sooner than later. I love making goals. To get back to exercise class. To take the dogs on at least one long walk a day. To schedule a regular date night with Dave and not let it fall by the wayside. To eat more fish. In keeping with at least one of those, I was trolling through the recipes on my brother's blog. He's begun incorporating more fish into his rotating repertoire lately, and I thought I'd take advantage of his testing rather than start with an unknown quantity that might or might not work out. 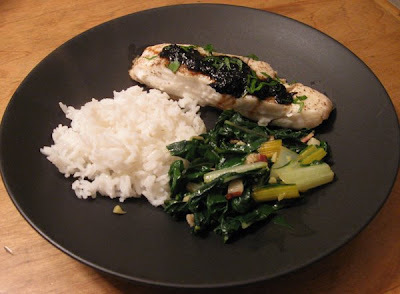 Since I can't ever seem to get enough Asian flavor in my diet, the halibut with nori jam that he found on the New York Times website seemed to fit the bill. And even though the extra step of making the "jam" was outside my usual just-throw-it-together dinner style, it went together quickly and easily and added that extra sparkle that made this recipe a keeper. 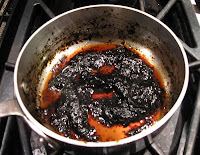 For nori jam: In small saucepan, combine soy sauce, mirin, vinegar and 1 tablespoon of water. Bring to boil and add nori, stirring until nori is soft, about 30 seconds. Transfer to blender and purée until smooth. Return to pan and cook over medium heat until thickened and jamlike, 2 to 3 minutes. For halibut: Preheat oven to 350°. Season halibut with salt and pepper to taste. Place large ovenproof skillet over medium-high heat and add oil. When oil is very hot but not smoking, add fillets skinned side down and let them sit until browned on underside, about 3 minutes. Transfer pan to oven and bake until cooked through, about 3 minutes. Transfer fillets to warm platter and spread each fillet with about 1 teaspoon of nori jam. Sprinkle with lemon juice, and garnish with chives. Serve immediately. With the market season winding down, I decided it was time to check back on the mother of them all, the Saturday Portland Farmers' Market at PSU. 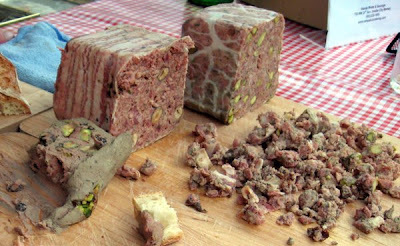 So this week in the Market Watch report you can not only find out what's available for your Thanksgiving table (like the patés from Viande, above) but what they'll have to make your holiday gift-giving so much tastier. Check it out! Not too far from the bustle of urban life but seemingly a world away from our citified concerns lies the little town of Gaston and, near it, Ayers Creek Farm. Anthony Boutard's reports give us a taste of what's happening just over the hill. 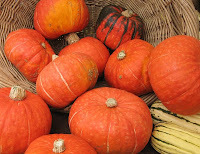 The beautiful autumn weather was good for harvesting the beans and corn, but slowed the winter vegetables substantially. Frosty nights stop the foliar growth, and it takes some time for the plants to warm up and growth to resume, especially when the cold morning fog lingers into the noon hour. Far from the moderating effects of the big rivers, tons of heat-retaining concrete and hundred of thousands of engine blocks shedding heat from their daily workout, our temperatures can drop about 10 to 15 degrees colder at night than those in Portland. Clear skies at night hasten radiational cooling. The Wapato Valley is also in a colder micro-climate, so we plant about two weeks later than in the Tualatin Valley north of us or the Willamette Valley to the south, even though we are at the same elevation, about 195 feet above sea level. The last two weeks, drenched with warm rain, the plants have been growing day and night, and the difference is visible in the field. 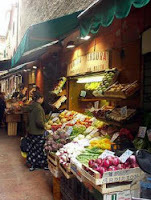 That said, we don't expect to have the chicories, endives and escaroles until the Christmas market, or early January. Consider it the toll exacted for such a lovely October. As for turnips, last year, we pulled about 50 pounds of them for the Christmas market. Exquisite as they were, golden, purple topped and white, we only sold 2 pounds. Oddly enough, turnips and the holidays were a bad mix. For the next month we had turnips at virtually every meal. Roasted, mashed, pickled, brined and stewed. And, of course, turnip souffle. 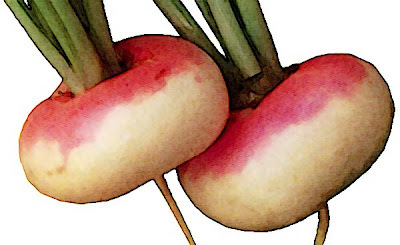 Over that month, we developed a deep appreciation for the turnip. They are back, and the earliest are ready. The "White Milan" turnip is round and similar to the familiar purple top turnip. The "Jersey Navet" is a distinctly pear-shaped turnip. It is a very old type, and it is great to open Vilmorin's "The Vegetable Garden" and see the same root illustrated. Produces a good head of greens, as well. Finally there are the "Early White" (Navet Blanc Plat Hântif). The root is very flat and grows above the ground. Vilmorin describes it as "pretty." We plant the turnips and rutabagas relatively late so as to avoid the flea beetles that mow down the emerging seedlings. The supply will improve as the season progresses and this warm, wet weather will help move things along a bit faster. Radishes, rutabagas and turnips are well adapted to the Pacific Northwest winter. Read the other posts in the Turnip Diaries series: Part II: Chestnuts, Persimmons and Turnips, Part III: Misery Loves Company, Part IV: We're In This Pickle Together, Part V: The Spicy Turnip, Part VI: The Turnip Also Rises, Part VII: WWPD (What Would Pliny Do). 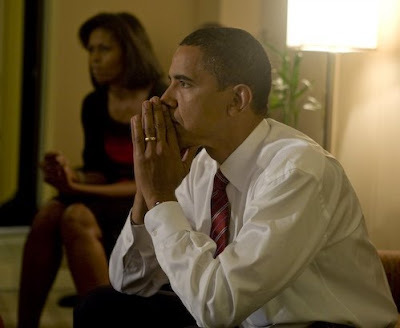 For an amazing backstage look at election night with the Obama family, go to this photo set on Flickr. Photo by David Katz/Obama for America. 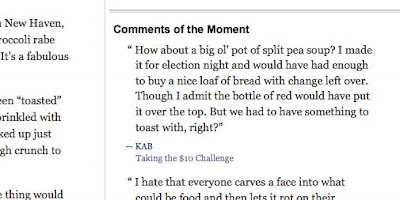 As I've mentioned before, I love Mark Bittman's blog, Bitten, on the New York Times website. His approach to food is thoughtful, simple and matter-of-fact while putting a premium on flavor. It's one of the few food blogs that I check on almost every day, and I leave the occasional comment. Well, today one of those comments was chosen as one of the "Comments of the Moment" on his front page. Woo hoo! Tough economic times. Making hard choices. How many times in the last few weeks have we heard those phrases? And now fast food joints are trying to tell us that they have the answer to feeding our families. 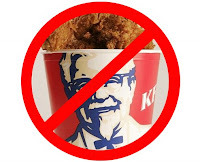 In a recent ad (you'll have to Google it yourself...I don't want to give them the courtesy of a link), KFC says it can feed a family of four for $10, calling it "The $10 Challenge." Leaving aside the arguments about the real cost of the food they serve, not to mention its questionable nutritional value, health consequences, etc., is this the only choice that Americans have for feeding their families? And is this a challenge that GoodStuffNW-erners are going to take lying down? I think not! So right here, right now, we're going to take on corporate fast food and show them how to eat well on a budget. You can read this article outlining the issues with some recipes to give you a start. And you've got the split pea soup recipe below (which, by the way, fed five last night with enough left over for at least another meal). E-mail your favorite under-$10 recipes with costs included by Wednesday, Dec. 31. My top ten picks will be published weekly starting in mid-January in a series called 10 Under $10. Remember, it has to feed a family of four and should be more or less nutritionally balanced. And you can assume that most pantries contain small amounts of flour, oil, herbs and spices, soy sauce, vinegars, salt and so on (larger amounts will have to be figured into the cost). Extra points will be given for creativity and, naturally, great taste! It took a huge effort to make it happen, and it'll take all of us to dig out of the mess we're in. But we've got hope! Tonight the guys are going to be busy setting up a media center based on an Election Night Guide to following the latest returns that was published in today's NY Times. Me, I've known what I'm going to do for a week now. The last thing I want to be doing is making a complicated dinner, or going to a party with finger food or, even worse, trying to follow the results on the big screen TV at a bar. 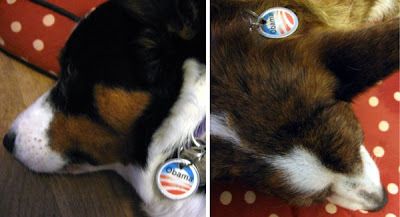 Tonight particularly, I want simple, comforting, filling food that will give me energy if things go well (yay Obama!) or provide ballast if not (heaven forfend!). 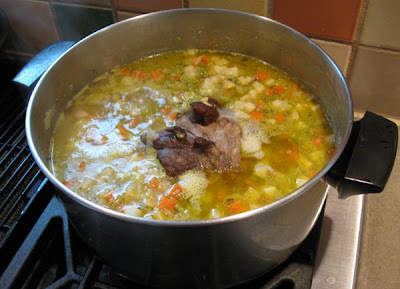 So you'll find me stirring a big ol' pot of split pea soup with a giant ham hock slowly melting into it. A glass of wine, a nice loaf of Como for sopping and I'm set for whatever comes my way. In a large Dutch oven or stock pot, heat oil until it shimmers, then add onion, garlic and carrots and sauté till tender. Add chicken stock, celery root, split peas, ham hock and spices and bring to boil. Turn heat down and simmer till ham hock falls off the bone (2-3 hrs.). Remove ham hock from soup and shred on plate. Using immersion blender or working in batches with upright blender, blend soup till smooth. Put shredded ham back in soup, thin with water if necessary and return to simmer. Serve. It may seem like the farmers' market season should be coming to a close, but the hardy vendors at the Hillsdale Farmers' Market, the subject of this week's Market Watch report, laugh in the face of winter. In point of fact, they're just getting geared up for the winter season when they switch to a twice-monthly schedule and start featuring a plethora of cold-season fruits, vegetables and comfort-heavy products. Read all about it! Details: Hillsdale Farmers' Market. 10 am-2 pm two Sundays a month (see website for schedule) in the Wilson High-Rieke Elementary parking lot behind the Hillsdale Shopping Cente. Our Man in Manhattan, Mark Dundas Wood, writes about an unusual beverage he heard about that he now keeps in his fridge at all times. Anyone know if it's available locally? One of the great things about living in New York City is that you get to meet people hailing from so many different parts of the world, with such a wide span of traditions. Human beings being what they are, the customs you tend to hear about first inevitably have to do with food and/or drink. My friend and co-worker Norman Chapman is originally from Guyana. He’s a talented sportswriter with his own blog, The Chapman Report. Norm can talk and write about pretty much any sport, but since he grew up surrounded by traditions passed down from the British Empire, he’s especially keen on tennis and cricket. He also has an almost encyclopedic knowledge of films and film stars from the 1940s and introduced me to the work of the imposing character actor Laird Cregar. Norm also turned me on to sorrel drink, which is made from the calyces of the roselle or red sorrel plant. Red sorrel is a type of hibiscus, and the tea that is made from it has a tart flavor that reminds me a little of pomegranate. Norm recalls making the drink from the raw flowers of the shrub, which he and his family would pick. I’ve read online about people salting the blossoms and eating them raw, too. You can buy the dried blossoms for the drink from Angel Brand. 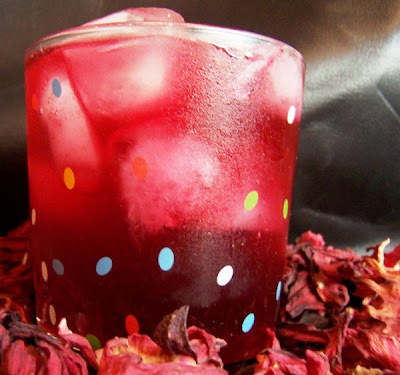 Sorrel drink is easy to make and extremely economical. It also is purported to be flavonoid-rich and healthful. You steep a package of the sorrel with a teaspoon or two of ground ginger in eight cups of boiling water. Let the boldly red concoction cool for about four hours, strain, and then transfer the liquid to a pitcher to refrigerate. You can add sugar or artificial sweeteners if you like, but I prefer to drink the beverage unsweetened, allowing the ginger to subtly undercut the tartness. I mix one part sorrel drink with one part seltzer or club soda. It’s a nice drink to serve in a goblet with dinner if you’re not having wine. Speaking of alcohol, in Jamaica and elsewhere in the Caribbean, sorrel drink is used as the base for a rum punch that is served as a spirited Christmas cup of cheer. So, this season—in lieu of eggnog or wassail—maybe you’ll want to put some reggae-tinged carols on the sound system and fill the punchbowl with this festive crimson potion. Carib Brewery Limited also makes a sorrel shandy, which I haven’t tried. But it sounds like it would be a refreshing summer-months drink.